Reliance Jio is back again with an impressive JioFi offer which is making head turns like the last time. This time the main highlight of the offer is the fact that Jio is offering benefits worth Rs 3,595 where people will only have to spend mere Rs 1,999, which is just the base price of JioFi and all these offers come along with the device. 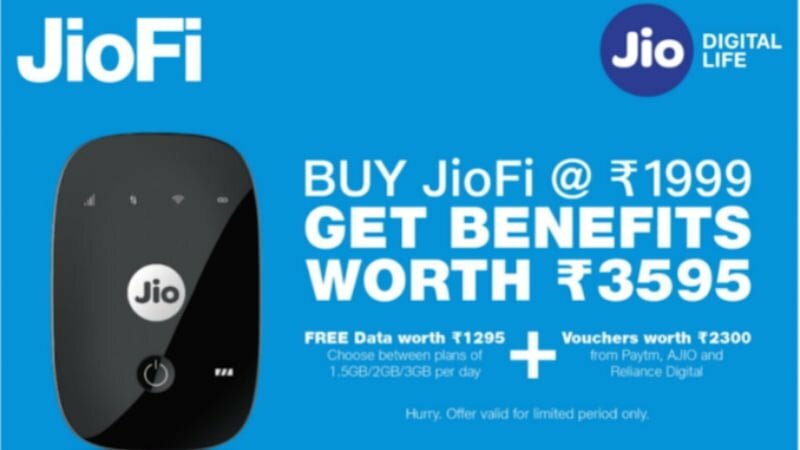 In the offer, customers are being given Rs 1,295 worth of free data on their JioFi purchase and an additional Rs 2,300 worth of vouchers which can be redeemed digitally on Paytm, AJio and Reliance Digital. This offer is bound to give a lot of value for money to the purchasers since Jio is not only giving free data which can be chosen from among the three plans but is also giving attractive vouchers to their customers. The offer is available on all Reliance Retail stores and is already up and flashing on the Jio website. What does this offer exactly mean and what benefits does it offer? Let’s find out. Firstly, on the purchase of the JioFi device, customers will be asked to choose between three offers. The first one will give them 1.5GB 4G data per day for eight months. The next plan gives us 2GB 4G data per day for six months. The last plan which increases the data cap up to 3GB 4G data per day, which extends for four months. All these offers also make the customer eligible for Prime Membership too. But we’re not sure about the validity of the JioPrime membership though. The existing JioPrime membership will end on March 31, 2018, for every Jio user and Jio is expected to make an announcement on the same. Given that people get a total of Rs 3,595 benefit with just a purchase of Rs 1,999 makes this offer a very attractive deal to miss on for someone who doesn’t already own a JioFi device. Like we told, the prime membership of Jio which usually costs Rs 99 also comes free with the purchase. Reliance Jio could have come up with an exchange offer, where users can submit their JioFi device and get a new one. But nothing has been introduced for now. All of the above offers on data call and membership are also accompanied by the digitally redeemable vouchers worth Rs 2,300 which can be redeemed on Paytm, AJio and Reliance Digital. On taking a closer look at the vouchers, we get to know that customers purchasing the JioFi device will receive Rs 800 cashback vouchers from Paytm, which have to be used on a minimum of two flight booking. Moving on to the AJio vouchers, Jio is offering Rs 500 offer on apparels on a minimum purchase of Rs 1,500. And finally, users will receive a worth Rs 1,000, which can be used for purchases at Reliance Digital. Do make a note that these coupons will appear on the user’s MyJio application, meaning they have to log in to the application to use these vouchers. Here’s a detailed procedure on how to manage JioFi account on MyJio app. We can definitely say that JioFi has been a successful device by Jio since its utility certainly matched its cost and the high popularity of JioFi paired with the impressive offers which Jio has rolled out hints us towards great sales number of the device. Jio is once again ready to capture the market with its strategic marketing and competitive offers and prices. Already, the telco secured a market share of 85% in the last two quarters with the impressive JioFi hotspot devices sale. And this offer will take the company to a whole new level for sure. as per the reliance digital employee,there wont be any prime charges after 31st March for the existing prime members.New customers have to pay 99/- after 31st March..In short 99 rupees is price of the sim..